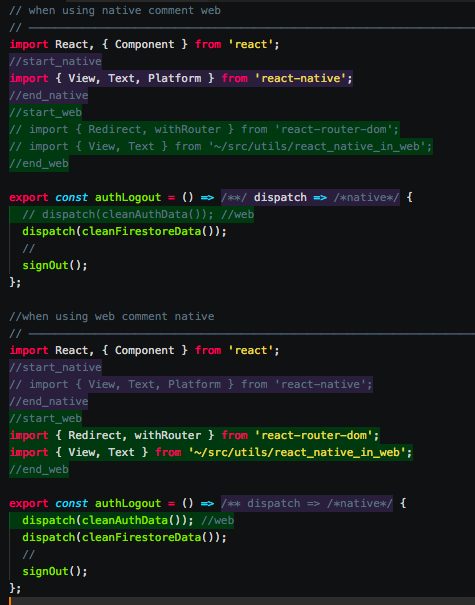 Visual Studio Code>Other>React-nat-web color differentiatorNew to Visual Studio Code? Get it now. It is practical to have the code of react-native and react-web in a single file, but in order to be able to reuse it in a practical way it is necessary to have well differentiated which parts of the code are unique to the platform and which are shared. That's why I created react-nat-web-differentiator. "native": "rgba(134, 91, 217, .25)"